If you are interested in sharing the benefits of touch with children then you may find the following contacts helpful. These are all individuals or organisations that we have worked alongside. Click on the name to be taken to the appropriate website. Teaching Children Meditation. Lorraine Murray has a range of books, resources and courses – for beginners to more advanced- for teaching mindful meditation to children. These include online courses. Healing Touch for Children. Mary Atkinson, co-founder of Story Massage, has written a book with suggestions for using simple touch therapy techniques – massage, reflexology and acupressure – with children at home to help ease common ailments. You, Me and ADHD. Leanne Brown writes a regular blog about living with a daughter with ADHD. 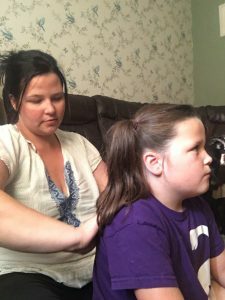 She says that Story Massage had been beneficial as a family activity and has helped her daughter learn to regulate her behaviour. Leanne, pictured below, is one of our Best Practice Winners. Therapies for Special Needs. Giuliana Fenwick is author of Indian Head Massage for Special Needs and runs courses in using head massage with children and teenagers with additional needs. Functional Reflex Therapy. Lorraine Senior runs courses offering a unique approach as a structured approach to sharing reflexology with children and adults with special educational and additional needs. 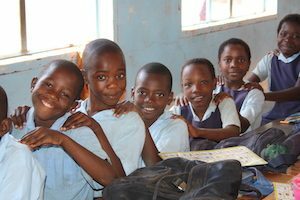 Lorraine recently shared the benefits of Story Massage at special schools in Zambia. ABC Kids INC. A great resource for finding the words of 50 favourite nursery rhymes for adapting as massage stories. There’s the added bonus of finding the meanings behind the lyrics too. World Nursery Rhyme Week. Held annually in November, this week celebrates the many different educational and social benefits of nursery rhymes for children. Register for free resources that are absolutely perfect for Story Massage activities. How to Massage People who have Dementia. 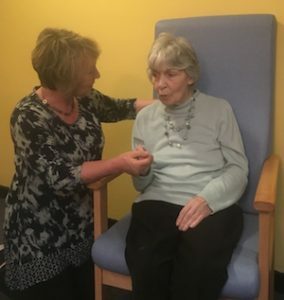 An approved day course run by Nicolle Mitchell, a Story Massage Instructor, to help provide nurturing skills in a safe and appropriate way for people with dementia.